Table Rock Wilderness is a pristine area of forest, boasting awe-inspiring views as well as soaring cliffs of basalt, a reminder of the area’s volcanic history. Roam the forests of Silver Falls State Park, where the Trail of Ten Falls will take you over, around and behind waterfalls that cascade more than 100 feet. Paddle the waters of the Willamette River. Called “the canoe trip of a lifetime” by Canoeroots Magazine, it’s the West Coast’s only National Water Trail. A freshwater diver explores the waters of Clear Lake. Nestled in the Oregon Cascades, Clear Lake has a submerged 3,000-year-old forest in its depths. Known by locals as the MRT, the 26.5-mile McKenzie River National Recreation Trail is a hiker, mountain biker and runner’s dream. 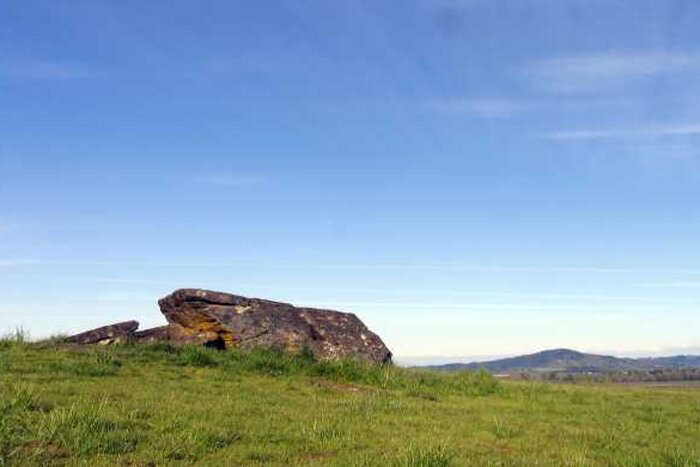 A mountain biker admires the view from atop Marys Peak, the tallest mountain in the Coast Range. On a clear day, you can see all the way to the Pacific Ocean in the west and Mt. Hood in the northeast. The soils that make this such fertile ground for vintners were deposited here by Ice Age floods that also left behind a massive reminder of Oregon’s prehistoric past at Erratic Rock State Park. As you travel to Oregon’s Seven Wonders, don’t forget to allow time to explore. Because sometimes, the places you discover along the way are the ones that make the journey worthwhile. Oregon’s Willamette Valley, home to the state’s most storied wine region, lies centered among the Seven Wonders. This is Oregon’s Promised Land — the region that beckoned to pioneers who trekked 2,000 dusty miles to find this place. Come discover the Willamette Valley’s Wonders. After experiencing the majesty of the Columbia River Gorge and Mt. Hood, take US 26-W to OR-211, passing through the small town of Molalla. Grab makings for the perfect picnic at Cindy’s Café and Catering, then continue to Table Rock Wilderness. Set aside for preservation in 1984, Table Rock Wilderness is a pristine area of forest, boasting awe-inspiring views as well as soaring cliffs of basalt, a reminder of the area’s volcanic history. Hikers and horseback riding enthusiasts alike love this area for its 16 miles of trails that wind through the forest. Come during the spring to see a dazzling, colorful display of wildflowers. Bring your binoculars or camera to capture the beautiful views and, if you’re lucky, the abundant wildlife that thrives there. Table Rock Wilderness serves as an ideal break from the hustle and bustle of modern life. After a day of hiking, head back to Molalla to unwind at Arrowhead Golf Course’s Farmstead Restaurant and Pub. Fall asleep at Prairie House Inn, a quaint, beautifully-restored 1900 bed & breakfast. Continue southeast on OR-213 past berry fields and family farms to Silver Falls State Park. 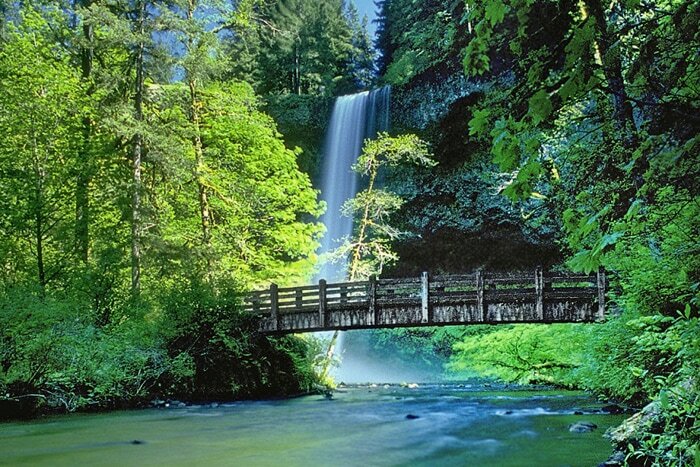 Situated within the foothills of Oregon’s Cascade Mountains about 25 miles east of Salem, Silver Falls State Park is Oregon’s largest state park (9,000 acres) and offers a great escape year-round. A large forested landscape, lovely waterfalls and nationally distinguished historic buildings provide recreation for the whole family including hiking, camping, fishing, swimming, picnicking and wildlife viewing. The Trail of Ten Falls is a designated National Recreation Trail and lures photographers, hikers and waterfall enthusiasts alike. Each of the three trailheads leading into the canyon starts atop of a 100-foot waterfall. Whether you are up for the full nine-mile trek or a shortened journey, the Canyon trail is an enjoyable hike as you explore from one waterfall to the next. Stop for lunch or dinner at The Silver Grille, located in historic Silverton. The Silver Grille serves Willamette Valley cuisine with a continuously evolving seasonal menu. Stay at The Edward Adams House B&B, a Queen Anne Victorian home designed and built in 1890 by Swedish master craftsman and millwright, Magnus Ek. In the morning, drive east through the foothills on Highway 22, where towering Douglas firs rise up to greet you and the peaks of the Cascades are calling your name. Make your way to Clear Lake, known to geologists as “The Lake Born of Fire.” Created 3,000 years ago by a lava flow, today this lake’s exceptionally cold and crystal-clear waters have preserved a sunken forest within its 200-foot depths, making it popular for fresh-water divers to explore. To preserve the lake’s serenity, power boats are not allowed. Instead, bring a canoe or kayak, or rent a rowboat by the day or the hour from the rustic Clear Lake Resort. The pristine waters provide views all the way to the lakebed, some of it consisting of still-visible lava flows. Order a hearty burger or a homemade fruit pie from the resort restaurant, then let the sound of lake water lapping the shore lull you to sleep as you spend the night in one of Clear Lake Resort’s cozy rental cabins. Choose from a historic rustic cabin, or a modern cabin complete with a kitchen, shower and restrooms. From Clear Lake, embark on a day of mountain adventure along the McKenzie River National Recreation Trail. 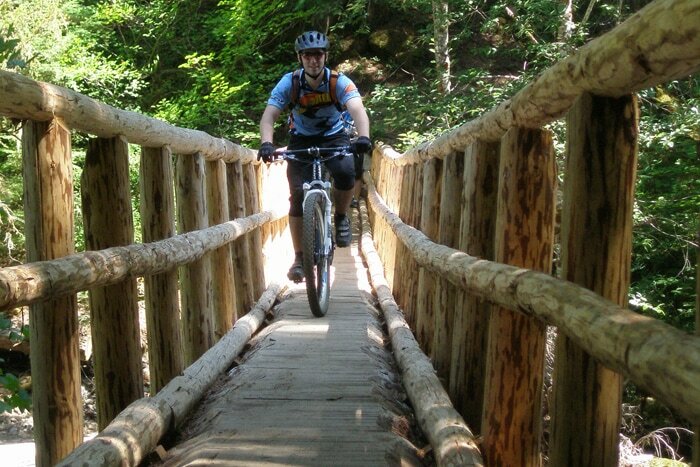 Known by locals as the MRT, the 26.5 mile trail is a hiker, mountain biker and runner’s dream. Bike Magazine named the MRT the #1 Best Trail in America and TheClymb.com named it one of the Best Running Trails in the U.S. It won’t take you long to see why. Venture over lava beds, under 600-year-old Douglas fir forests to thundering Koosah and Sahalie Falls. Traverse handmade log bridges over streams along a two-mile section of the trail from Trailbridge Reservoir to Tamolitch Pool, the bluest natural pool you’ve likely ever seen. This is where the mineral-rich McKenzie River emerges from a three-mile subterranean crawl through basalt lava tubes. 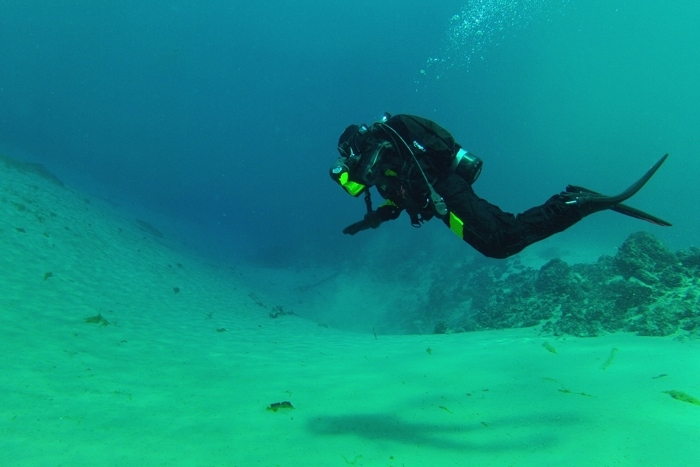 The topaz blue water is so clear that sometimes you can see more than 100 feet to the bottom. After a day of hiking in the Cascades, travelers have a choice: head east to connect with wonders like Smith Rock, the Painted Hills or The Wallowas. Or, bask in a hot spring and spend the night at Belknap Hot Springs Resort. Surrounded by the Willamette National Forest, Belknap Resort offers lodge rooms, cabins, RV and tent camping. The secret garden is a must-see. And don’t forget to bring your bathing suit for the two mineral hot spring pools. 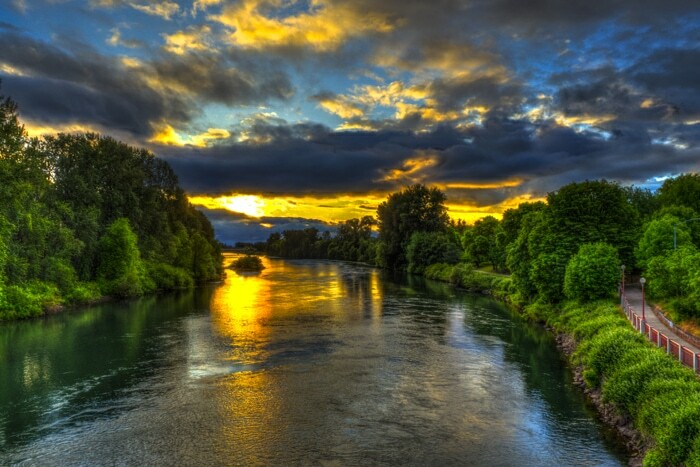 After breakfast at Belknap, take Hwy 126 west to Eugene, where the scenic Willamette River flows right through the city. The 187-mile Willamette River, the West Coast’s only National Water Trail, is a playground for anglers and paddlers. Canoeroots Magazine named the Willamette one of their “canoe trips of a lifetime.” Trout, salmon and sturgeon live in its depths, and osprey, beaver and river otters make their home along its shores. From its headwaters in the Cascades to the confluence with the Columbia River, it flows northward (one of only a handful of north-flowing rivers in the U.S.) past fields, forests, parks, and farms, and through communities large and small. Rent a canoe, kayak, paddleboard or raft from Oregon Paddle Sports in Eugene and get acquainted with this remarkable waterway. A day on the river will give you a hearty appetite: stop to eat at Falling Sky Brewing House. Sip handcrafted beer and sodas while munching on locally-sourced charcuterie, pickles, sausages, braised brisket and more. Mingle at picnic-style tables in the beer hall or relax in the beautiful outdoor garden. When it rains, pints are 25 cents off. Spend the night at Valley River Inn, which sits right on the river. The newly renovated rooms provide unrivaled river views. Here’s another tough choice: do you head south to breathtaking Crater Lake? Continue west to the Oregon Coast, where you can play on sand dunes and drive up the unforgettable Oregon Coast Highway? 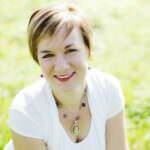 Or remain in the lush Willamette Valley for a journey north through wine country? Travelers coming straight from Eugene can journey north via 99W, a scenic country road that travels past farmland and vineyards. Travelers who took an Oregon Coast detour can turn east in Waldport, following Hwy 34 through the Alsea Valley to the base of Marys Peak. 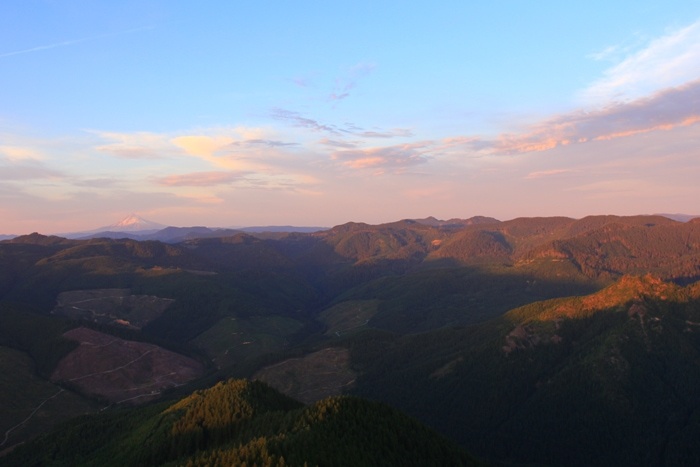 At 4,097 feet, it’s the highest point in Oregon’s Coast Range. On a clear day, from the top of the peak, you can see the Pacific Ocean to the west and the peaks of the Cascade Mountains across the valley to the east. The rich rolling alpine meadows of Marys Peak are fringed by a noble fir Forest. Wildflower displays in the meadow and rock gardens change throughout the late spring and summer months. 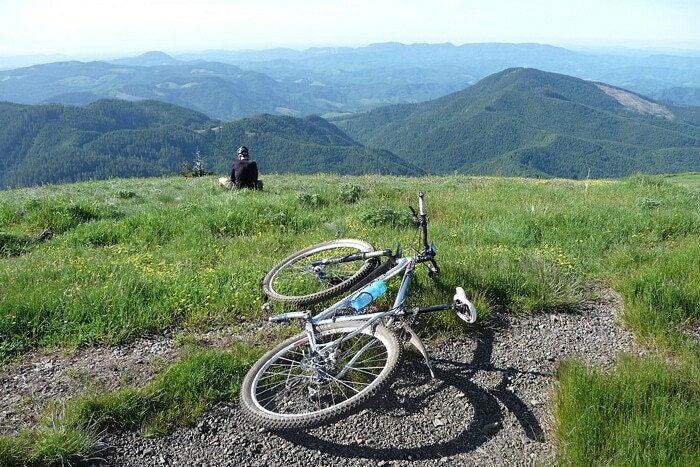 Hike, mountain bike, or camp on Marys Peak, then make your way back down to the Valley, where the friendly university town of Corvallis awaits. Eat at del Alma Restaurant and sample tasty fusion food with European and African influences made with local ingredients in a gorgeous riverside setting. Stay at the Holiday Inn Express on the River and treat yourself to a hot continental breakfast in the morning while you look out at the Willamette rolling by. Take Highway 99W north though the Eola-Amity Hills and toward the Yamhill Valley—you’re approaching Oregon’s most-storied wine country, home to the largest number of vineyards in the state. The soils that make this such fertile ground for vintners were deposited here by Ice Age floods that also left behind a massive reminder of Oregon’s prehistoric past—at Erratic Rock State Park travelers can trek to the top of a hill to marvel at a 90-ton ice age boulder left here by the floods. The 600-million-year-old rock is made of argillite and is the only rock of its kind in the United States. Stop in the foodie town of McMinnville, home to the International Pinot Noir Festival, for a meal at Nick’s Italian Café. Since 1977, Nick’s has been putting McMinnville on the gastronomic map. Stay at Third Street Flats, posh European-inspired vacation rentals located in the heart of McMinnville’s downtown. Closing the loop: Travelers can head northwest from McMinnville through the heart of the Yamhill Valley, stopping in the Dundee and Newberg areas for tasting pinot noir at one of Oregon Wine Country’s many renowned vineyards. Highway 99W will take you to Portland, where you can finish your journey in Oregon’s largest city or wind up back where you started from at the gorgeous Columbia River Gorge. We’re betting you’ll return home from the Willamette Valley with a bottle of wine (or two) in your bag, a camera full of perfect wine country shots, and a lifetime of iconic Oregon moments in your memory.